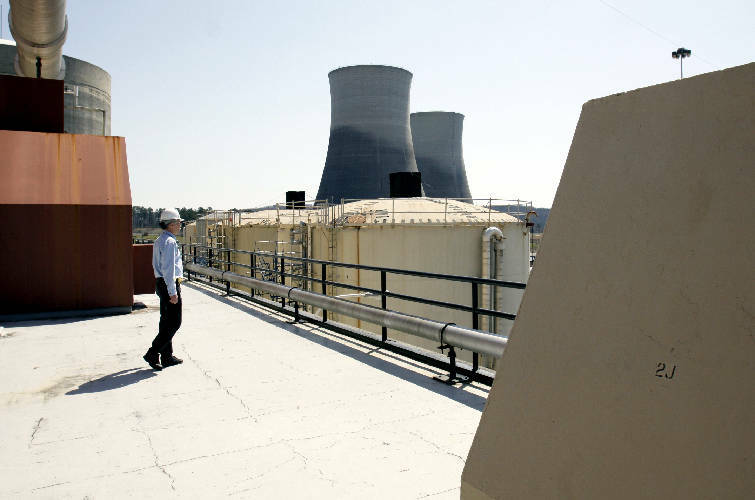 Terry Johnson walks toward the TVA Sequoyah Nuclear Power Plant's cooling towers in Soddy-Daisy. With a Yucca Mountain waste storage plan all but dead and President Barack Obama pushing hard on nuclear energy, the question of what to do with nuclear waste is more radioactive than ever. Waste from TVA's Sequoyah, Watts Bar and Brown's Ferry nuclear plants continues to pile up at the facilities. Like all of the 104 operating nuclear reactors around the country, tons of the plants' highly radioactive waste was supposed to eventually be transported to the proposed Yucca Mountain, Nev., underground resting place to wait out its 50,000-year decay. The Volunteer State has an additional and little-known stake in the demise of Yucca Mountain, the ridge of volcanic rock that until a few months ago was the main focus of a controversial $10.4 billion search for a permanent nuclear waste repository. Tennessee's Oak Ridge National Laboratory, the site of the nation's Manhattan Project, has done pilot research on high-level nuclear reprocessing -- a chemical process to separate highly radioactive spent fuel to recover unused energy. Some have called the process nuclear waste recycling. Tennessee also already has seven licensed low-level nuclear waste processors. Watchdog groups say Tennessee has more of those facilities than anywhere else in the country. Low-level radioactive waste comes from commercial reactors, but not from the fuel assemblies. It includes materials such as cooling pipes, tools, mops and cleanup suits that have become contaminated at the facilities. Tennessee's near monopoly on low-level nuclear reprocessing and Oak Ridge's pilot research increase the likelihood that political and nuclear industry leaders could target the Volunteer State, or at least the Southeast, when seeking new ways to deal with the nation's growing nuclear waste, some nuclear industry expert say. "If I lived in Tennessee, I'd be thinking we already have a lot of spent fuel and a lot of waste here, and the federal government just canceled the only viable option to get it out," said Dr. Edwin Lyman, a senior staff scientist for the Cambridge, Mass.-based Union of Concerned Scientists. The science and environmental nonprofit watchdog group is neither pro-nuclear nor anti-nuclear, Dr. Lyman said. But where Dr. Lyman sees potential for concern, Dr. Sherrell Greene, director of Oak Ridge National Laboratory's nuclear technology programs, sees opportunity. "Recycling the waste is a better strategy than storing it," Dr. Greene has said, noting that 90 percent of the spent fuel's energy remains in what now is treated as highly radioactive waste. "I feel a personal responsibility to my children. I think about the world they are going to inherit. ... We have got to solve this problem, and this is an approach that we can take," Dr. Greene said in 2007 when Oak Ridge became one of a handful of labs to win a grant from DOE for a pilot demonstration. Last month, the Obama administration pulled the funding for Yucca Mountain and U.S. Energy Secretary Steven Chu appointed a blue ribbon panel to look at alternatives. The panel will convene its first meeting later this month. But talk in nuclear and political circles already has turned to nuclear reprocessing. It's a technology used in France, Japan and Russia, but one that's been rejected several times in the United States over the past three decades, including one 1980s proposal in Tennessee called the Clinch River Breeder Reactor. The hope was, and is, that researchers can develop a method to extract the usable portion of the spent fuel without isolating plutonium, the material of proliferation and terrorist appeal. Current reprocessing leaves behind highly poisonous nuclear waste. This waste, however, degrades in tens of years instead of tens of thousands of years, which makes the need for very long-term storage less acute, experts say. In the Oak Ridge pilot, Dr. Greene's crew removed uranium and plutonium together, so the plutonium was not isolated and so was less of a terrorist threat. The team processed just 45 pounds of material, and Dr. Greene acknowledges they are a long way from proving the process can be done on an industrial scale. "I'm confident we can find a way to do this," he told Forbes magazine last month. On Friday, state officials announced that Energy Secretary Chu this week will visit Oak Ridge to meet with the staff of the Y-12 National Security Complex and Oak Ridge National Laboratory. He will tour the laboratory and dedicate Y-12's new $549 million Highly Enriched Uranium Materials Facility -- a warehouse for weapons-grade uranium. A Department of Energy Web site states other uses of the highly enriched uranium "include downblended fuel for commercial, research or medical isotope production reactors." Downblending is one method of reprocessing. Dr. Lyman said no one wants a nuclear reprocessing facility in his backyard, because there still will be nowhere to send the new waste. "I wouldn't want a reprocessing plant in my state," Dr. Lyman said. "It will just be a magnet for more waste. There is only one facility now where even low-level waste can go for disposal -- in Utah." Some Tennessee politicians are concerned, as well. State Sen. Andy Berke, D-Chattanooga, in January submitted a bill that would prohibit the acceptance and storage of radioactive waste at landfills or commercial facilities in Tennessee. A companion bill in the Tennessee House of Representatives has been introduced by Rep. Ty Cobb, D-Columbia. Last week, saying he wants to stop 20,000 tons of foreign nuclear waste from potentially being stranded in Tennessee, Sen. Berke amended the bill to specifically ban a type of reprocessing: downblending. "The ramifications of allowing downblended nuclear waste into Tennessee will be disastrous for generations," he said. "The highly radioactive waste will endanger our families, our communities and our environment. I'm not going to let Tennessee become the world's Dumpster." The Tennessee Valley Authority hasn't taken a position on high-level or low-level reprocessing, said Ray Golden, TVA's spokesman for nuclear operations. "We believe it is important for us to produce as little waste as possible," he said of the low-level nuclear waste. "And we think we do a good job of minimizing it. We've dropped our number by tenfold." Mr. Golden said TVA in fiscal 2009 generated 812.56 cubic meters of low-level radioactive waste. Only the least radioactive of that waste was sent offsite to Utah for disposal. The rest is stored at the Sequoyah and Browns Ferry nuclear plants, he said. The Browns Ferry plant has about 15 years' worth of low-level waste storage space, he said, while Sequoyah, which also stores the low-level waste for Watts Bar, has about 40 years' space. Diane D'Arrigo, a researcher for Nuclear Information and Resource Service, took aim in 2007 at Tennessee environmental regulators over the state's handling of low-level waste. In her 2007 report "Out of Control -- On Purpose: DOE's Dispersal of Radioactive Waste into Landfills and Consumer Products," Ms. D'Arrigo stated that low-level radioactive materials are being released from low-level nuclear processing facilities in Tennessee to regular landfills in the state. She found that Tennessee reprocessors were permitted to send low-level waste to Middle Point Landfill in Murfreesboro. The landfill operator, BFI, stopped taking the material in 2008 after irate residents petitioned the state to stop permitting the low-level waste processors to place the waste in their landfill. Other communities around four other landfills also have raised concerns. The landfills are Carter's Valley in Church Hill, Chestnut Ridge in Heiskell and North and South Shelby landfills near Memphis. Ms. D'Arrigo said the concentration of low-level waste handlers in Tennessee bears watching. Tisha Calabrese-Benton, spokeswoman for the Tennessee Department of Environment and Conservation, bristled at Ms. D'Arrigo terming Tennessee low-level radiological waste handlers "reprocessors." "A reprocessor deals with spent nuclear fuel. That is not low-level radioactive waste. Processors decontaminate, sort, segregate and volume-reduce low- level radioactive waste," she said. She said the state's radiological oversight, called the Bulk Survey for Release program, "allows materials with incidental levels of radiation to be disposed by specific processors into specific landfills under specified conditions." * 33 of the nation's 104 operating reactors are in the Southeast. * 12 are in the Alabama, Georgia and Tennessee. * 61,700 metric tons of nuclear waste is stockpiled around the country. * 81,000 metric tons will accumulate by 2020. * $17.2 billion has been paid by commercial nuclear operators for a waste solution. * $11 billion has been spent on Yucca Mountain. contaminated material for disposal in Utah. She also said the state's program underwent "extensive independent review by the Solid Waste Advisory Committee in 2007 and the program was found to be safe." Additionally, NRC performs regular audits of the program. "The last was in 2008, and NRC found no issues pertaining to the (state's) program," she said. Donnie Safer, chairman of the board of the Tennessee Environmental Council, said nuclear power plants from 36 states recently lost access to a low-level reprocessor in South Carolina. Now, he said, they have nowhere to turn but Tennessee. "At a time when there's talk of building 100 new nuclear reactors, Tennessee is smack in the middle of the wrong type of growth industry," he said. Click here to vote in our daily poll: Should nuclear waste be stored in Tennessee? Be sure to continue following this story as Pam Sohn takes you further inside this nuclear waste issue.